We finally have meaningful lacrosse being played this coming weekend. It’s a few weeks late and several people including myself probably gained a few ulcers getting there, but we finally have meaningful lacrosse. And to be honest, I’m happy that my daily texts and DM’s are all about players being released, picked up, trades happening than I was three weeks ago where my DM’s were full of whether there was even going to be a season. Part of the reason I haven’t been able to get Random Thoughts out as much as I would like is that between my paying job being extremely busy and the whole CBA situation turning into a part time unpaid job, I was exhausted. I was quite happy to be back at the SaskTel Centre last Saturday to just simply watch lacrosse and absorb everything I could in that game. Unfortunately in Saskatchewan, fans won’t get another chance for a home game until January 5, so we have some waiting and some Bleacher Report games to watch in the meantime. But at the end of the day, the game between the Rush and Mammoth scheduled for December 8 will be made up at the end of the year, the championship banner still goes up to the rafters on January 5, and with Adrian Sorichetti, Tor Reinholt, Johnny Pearson and Dan Dawson who were all a part of that championship team in the building, wearing grey and purple, but still there to be a part of it. It was an unusual experience recording the Lacrosse Classified podcast this past week. With no regular season games to gauge and book guests based on them, we were able to secure guests well in advance in Kiel Matisz and Curt Malawsky. However, we had scheduled interviews so that we needed to start taping at 4:30pm Saskatchewan time (5:30pm Eastern). 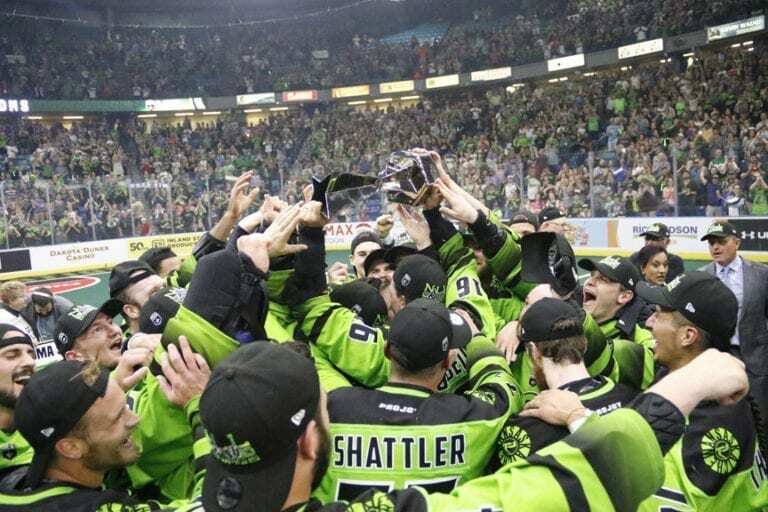 While final rosters were due at 10am Eastern that same day, it literally wasn’t until around 3:30pm to 4:30pm Saskatchewan time that teams started to announce their rosters. It made for a chaotic opening to the show as we literally had the information on some of the teams 10 to 15 minutes ahead of our start, and teams like Saskatchewan and San Diego coming in as we were taping. It led to some errors because there wasn’t the time to digest all of the information so quickly, but it was also a unique process that the listener got to see us changing our opening comments as we had to adjust on the fly. In the final rosters there weren’t many major names being cut. In part this had to do with the fact that because teams had each lost two players to the expansion draft, they had holes to fill and it meant that their veteran players were that much more valuable. What we did see this year was that a lot more opening round draft picks making rosters and a lot of practice rosters being filled with draft picks or street free agents, which was good. A 6th round pick in Saskatchewan in Tyler Gaulton temporarily made the Rush active roster (likely to be sent to the practice roster once the Rush’s holdouts are signed) and their other 6th round pick in Zach Gould making the practice roster are things that were unfathomable with the Rush just a year ago. A year ago, 2nd round picks had a hard time making the practice roster. In Colorado, 6th round pick Steven Lee made the practice roster. As much as we worried that draft picks would have their chances of making a roster torpedoed, a number of them managed to stick around. The reasons for so many rookies making NLL rosters were threefold. First, there was one additional roster spot agreed to in the CBA negotiations. It might be one spot, but one spot makes a big difference when you’re a young player trying to make it in the NLL. Secondly, the expansion draft created 18 holes to fill amongst the existing 9 teams. Once again, for young players, this gave them the chance they needed. The third issue was holdouts. Saskatchewan has three key holdouts still in contract negotiations in Robert Church, Mike Messenger and Nik Bilic. Calgary has holdouts in Curtis Dickson and Wes Berg. New England has Kevin Crowley. Once again, holdouts create roster spot opportunities. These opportunities might be temporary, but when you’re a young player trying to crack a roster, getting a few extra weeks to prove yourself is absolutely critical to getting that extra look you might need to make your way into the league. With two more expansion teams on their way next year in New York and the new Rochester team, it’s a good time to be a young player because now you have a much better chance at making a roster. I’ve had over a hundred questions by now from fans in Saskatchewan regarding the three remaining holdouts. While details are minimal, here’s the issues at hand. In Church’s case, he was a restricted free agent, subject to qualification. This is where I wish the CBA was a public document, but my understanding is that as long as the Rush made a qualifying offer that Church would receive a 5% pay raise over last season, he remains a restricted free agent. That 5% raise means that Church is nowhere near league max. A player of Church’s stature is certainly worth league max. The problem is the Rush have so many players that are worth league max, it causes salary cap and luxury tax issues. The solution is certainly not easy. I would hope that a long term solution, along the lines of the three year agreements that several Rush players signed this year can be worked out with Church. The Rush experimented with two setups without Church on Saturday night. The three lefty set worked reasonably well. Moving Jeremy Thompson forward didn’t work at all. In Messenger’s case, its far more complicated. Messenger is now a 3rd year player. In year two, player salaries range from $12,000 to $17,000, a fairly narrow range, and Messenger had held out last year over money. Once a player is in his 3rd year, the salary range goes to $16,000 to $31,000. Now the range is not so narrow. Is Messenger worth more than the league average of $20,000, absolutely. But once again, you’re dealing with the Rush with a lot of players worth more than league average. Messenger is a terribly popular player in Saskatchewan and people are worried. As for Bilic, I would imagine that he is earning close to league minimum. He may have thought he has more leverage with the Rush having holes on defense, but the trade to acquire Travis Cornwall derails those plans a bit. I can’t see the Rush giving into Bilic nearly as easy as the other two holdouts as he is certainly easier to replace. You never want to replace guys, but unfortunately its part of the business if something can’t be resolved. In the case of Dickson and Berg, what these two are after is a little more confusing in that their circumstances are different and there is little information out there. In Dickson’s case, he was franchised to avoid him becoming an unrestricted free agent. That means for this season anyways, his salary is fixed at just over $39,000. So why the holdout? There are only two possible explanations. One would be that Dickson wants a long term deal in place. The franchise tag only guarantees him his salary for one year. The other possibility is whether secondary incomes such as appearance money, camp money or expense reimbursements such as rent are issues that need to be worked out. Berg held out a year ago as well. So his decision to hold out again isn’t overly surprising. The issues behind his holdout aren’t clear, and I’m not surprised we couldn’t get an answer out of Curt Malawsky as to an update on their status. The Rush have a bit of a luxury that they don’t play until December 28, so there is time to negotiate with their holdouts. Calgary plays this weekend and the urgency is greater. Like Dickson, Crowley is a franchised player, so the negotiation could be over a long term deal, or whether Crowley wants to stay in New England. It’s a complete unknown. Well, is not quite New York city, but the NLL has its 13th franchise in Nassau on Long Island just to the east of New York City. The move to Nassau was hardly a surprise. Once the money was invested to upgrade the Nassau Coliseum, the arena needed tenants. The Islanders are moving half of their home games to Nassau which helps, but it doesn’t fill enough dates. Placing the NLL team in Nassau accomplishes two key components. First off, the main concentration of lacrosse players and lacrosse fans in the New York area are on Long Island, so it makes it convenient for those fans to make games. Secondly, the lease cost in Nassau is just a fragment of what it would be at Madison Square Gardens in Manhattan or the Barclays Center in Brooklyn. New York teams in the past have folded or moved simply because leases were too expensive or floor times they were receiving were poor to draw the proper crowd. That will be far less of an issue in Nassau. I really hope the team revitalizes the nickname the New York Saints, as it draws to a significant past in the NLL and gives the team a far stronger identity than the other names the team is suggesting, but we shall see. The obvious issue is that with 8 teams in the east and 5 teams in the west, the NLL has to look at a division realignment. But don’t get too excited about that until the next offseason. This is the NLL after all. Teams relocating is an unfortunate reality and before the league looks at a division realignment, it needs to know if any teams are relocating first. While most markets should be secure, the question of the long term viability of a team in Georgia remains in doubt. Its time for my annual pre-season predictions. I always manage to get a few of these dead wrong, and if teams feel slighted that I didn’t pick them higher, its fair game to tell me “I told you so” at the end of the year. Some people might say this is the safe pick, but the Rush are still at a different level in their skill and cohesion than the rest of their western counterparts. Yes it was the preseason, but the Rush were a whopping 7 for 8 on the powerplay in the exhibition game against Calgary, with both teams putting in their expected special teams lineups, with the exception of Robert Church. Once Church is signed, the Rush have that much stronger of a powerplay unit. The one difference the Rush may face this year with some gaps to fill on the defensive side is winning games 15-13 instead of 11-9. However, Nick Finlay will be just fine making the move to an every day starter and Travis Cornwall looked reasonably comfortable in the Rush defensive system in the exhibition game. And to think, the Rush have three 1st round picks next offseason, theirs, Toronto’s and Vancouver’s. The only debate in this prediction in the west was whether I put Colorado or Calgary 2nd, and you could still convince me to change my mind on it, its that close. So I’ll leave it to this, Colorado finishes 2nd in the regular season, and loses to Calgary in the west semi-final. If you compare the two teams, goaltending is pretty much even, Calgary has an advantage on offense (although the likes of Keogh, Benesch and Noble is still a lethal combination), but I simply like the consistency of Colorado’s defense far better. So when I’m picking at straws, its the small difference that makes the choice for me. 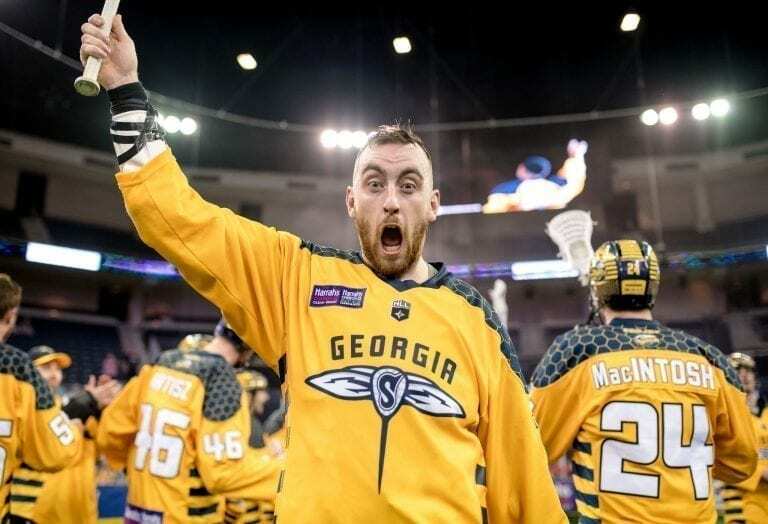 Plus, the addition of Andrew McBride is a major pickup for the Mammoth that will only enhance the team defense even more. Christian Del Bianco Calgary Roughnecks. Photo: Candice Ward. I’m going to assume for now that Curtis Dickson and Wes Berg do ultimately sign and end their holdout before the season starts, or in the worst case scenario, they miss just one game. Calgary has a potent of an offense as anyone in this league at the moment with the likes of Dickson, Berg, Dobbie, and now Duch and King. Zach Currier will be terrorizing opponents in transition all year once again. One key as to how far Calgary will go this year is whether Christian Del Bianco can repeat his amazing performance from last season. Not only is he the most athletic goaltender in the league, but his strong stick skills are a massive danger to any opponent feeding players well down the floor. If he can repeat, or even improve on last season, Calgary will be very dangerous. Calgary’s issues are on defense and watching their preseason game in Saskatoon, those problems still exist. The lack of faith on my part in their defense is why I have them ranked as low as I do. San Diego is the big unknown this season as you have a lot of talented players in their lineup, but you never truly know how well they will work together, especially when their only preseason action was an inter-squad game. But I have enough faith in them that they won’t finish in the basement in the west. The things the Seals have going for them are defense and goaltending. They have a proven starter in Frank Scigliano in net, which is a good sign to start, and they surrounded him with a lot of recognizable names in the expansion draft including Cam Holding and Adrian Sorichetti and then signed of the best Brodie Merrill in free agency. It was an interesting strategy to go a defensive route rather than a high flying offense to draw the crowd in, but its one that I think will pay off in the future in my opinion. Furthermore, San Diego has for the most part built a team based on youth, which too should pay long term dividends. This isn’t to say their offense isn’t something to watch out for on its own. Bringing in vets such as Kyle Buchanan and Dan Dawson are going to give the youth the leadership they need to form that team identity. They also have Casey Jackson who is coming off of an amazing season in the WLA this past summer. And then you have Austin Staats. The sky is the limit for this kid if he can stay away from his off the field problems. I’m expecting San Diego to win 5 to 6 games this year, but I’m still expecting that even a 5-13 record will be better than that of the Warriors. The building process in Vancouver this season is almost as large as it is for the expansion teams. A 2-16 season last year, and now Rhys Duch being released, Corey Small being traded and very few draft picks in the system this year and next year mean the task is a very difficult one. The Warriors did manage to sign free agent goaltender Aaron Bold. Bold’s numbers did drop last season in New England, not having the benefit of an amazing defense in front of him, and that’s one thing that concerns me about his move to Vancouver. He may be tasked with trying to bail out an even worse defense, made even weaker by the trade of Travis Cornwall to Saskatchewan. It was this same defense that allowed 20+ goals four times last year, and I just don’t see where the improvement will come from. On the offensive side of things, perhaps the Small trade which landed the Warriors Mitch Jones will lead to better offensive chemistry between Jones and Logan Schuss, but Vancouver needs net crashers, something that was desperately missing last season. I just don’t see much progress being made to make the Warriors regular winners on the circuit this season, which is why I have them last in the West (2nd last overall). Undoubtedly, the East Division was the far more difficult division to predict the order. Keep in mind, as many people have forgotten, the East Division was so tight last year that going into the last week of the season, nobody had clinched a playoff spot and nobody was eliminated. As such, you are literally picking at straws as to who will finish where. You could easily convince me I’m wrong on the top four teams on this list. The Bandits might be the boring pick considering most people are predicting them to finish 1st, but its also the honest choice. 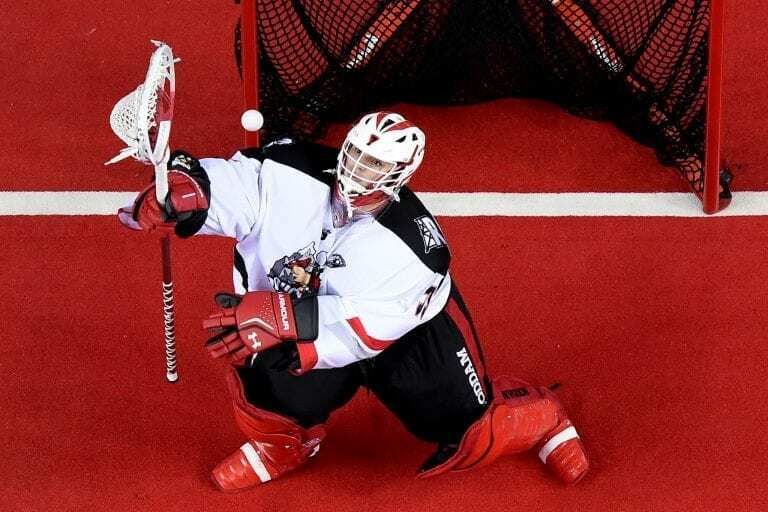 The Bandits never had many issues with their offense last year, but their defense was razor thin after Steve Priolo and their goaltending was certainly weaker than most of their opponents. Both issues have been solved. Matt Vinc’s signing makes then a lot stronger in net. Trading for Bryce Sweeting, drafting Gillray and McKay as well as gaining some depth on the defensive end, this team is going to be a lot better than last year in my mind. 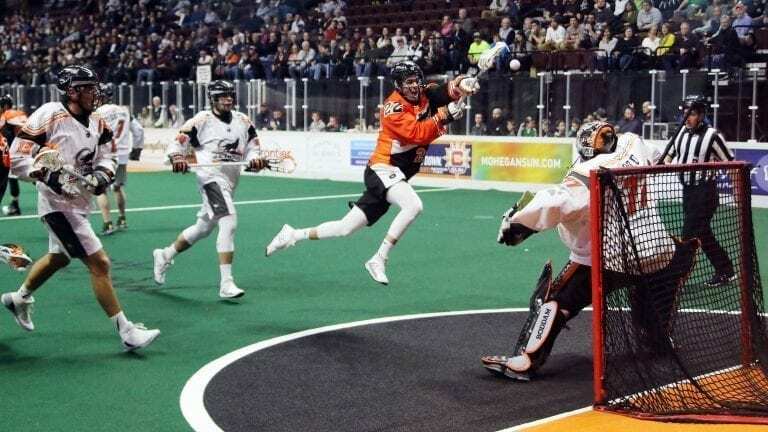 When you are looking at an extra couple of wins meaning the difference between winning the division and missing the playoffs, the Bandits have done enough to get over that hurdle. There’s no question that the Swarm lost a few major weapons in Kiel Matisz and Jordan Hall in the expansion draft, but they are still very lethal. Trading away Jessie King was also a major move, but Holden Cattoni is a good player to get in return if you had to move King. But regardless of the losses, you still have the main components of what made this team successful in the Thompsons, Shayne Jackson, Randy Staats, Jason Noble and Mike Poulin. Simply put, there is no reason to believe that the Swarm won’t be as dangerous as they have been the last three years. This is where the order really got tough for me and I truly debated hard back and forth about the next two teams. To start, we need to keep in mind that Rochester was just one game away from winning the NLL Cup last year. They lost Josh Currier and Frank Brown to the expansion draft and Matt Vinc to free agency, but the rest of the team remains intact, including most of the defensive core that got them to the finals last year. The key to their survival likely lies in the play of Angus Goodleaf, who gets his shot at being an NLL starter. Goodleaf is still a good goaltender. He’s not Matt Vinc, very few goalies are, but he’s still good. 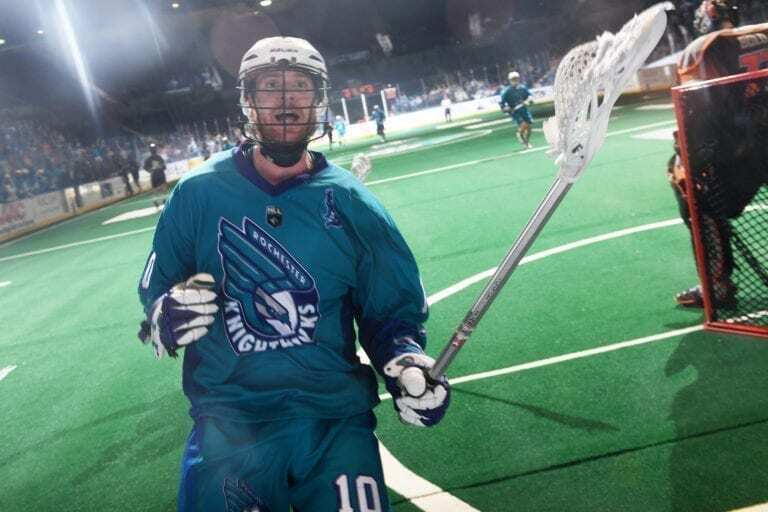 Up front, I was surprised the Knighthawks protected Eric Fannell over Currier, and with Fannell on the Physically Unable to Perform list, they have some holes to fill. But once again, most of their offensive weapons are still in place, and they’re young. Cody Jamieson is still as dangerous as ever. Joe Resitarits should still produce around as well as he did last year. Kyle Jackson and Austin Shanks will still produce. And one of the biggest keys for Rochester, Jake Withers is still the dominant force on faceoffs. People read this stat differently, but when you have a player that can get you as many additional possessions as Withers does, it makes a huge difference over the course of a season. At the end of the day, I don’t think the Knighthawks have declined nearly enough for them to completely miss the playoffs this year, but I could easily be wrong. If anything might distract from Rochester this year, its what’s happening off the field in the roster’s move to Halifax, and how that plays out is difficult to predict. Perhaps I have the Rock finishing lower than most, but there is good reason. Their goaltending remains solid with Nick Rose. Up front, they are very strong. Despite losing Brett Hickey, simply between the three big guns in Adam Jones, Rob Hellyer and Tom Schreiber, they are in good shape, but that’s assuming they stay healthy. Both Schreiber and Helyer have missed significant time the last few seasons with knee injuries, and perhaps that’s my main concern as to why I’m ranking them lower than others. Keep in mind we are looking at the tiny differences that divided the East Division last season. Defensively the Rock lost Brodie Merrill, which is a big loss, but the likes of Challen Rogers and Latrell Harris keep getting better and better. If they can continue to up their game, the future indeed might look bright for the Rock. There’s a few reasons I’m not a huge fan of the Black Wolves going forward. The first key is that last season, when they won, they won by one goal four times and two goals twice. Despite a winning record last year, the Black Wolves had a goal differential of -48, or -2.67 per game. To make matters worse, their franchise player, Kevin Crowley, is holding out. This isn’t good. Kyle Buchanan has departed for San Diego. And the team that is slowly aging, just got one year older. 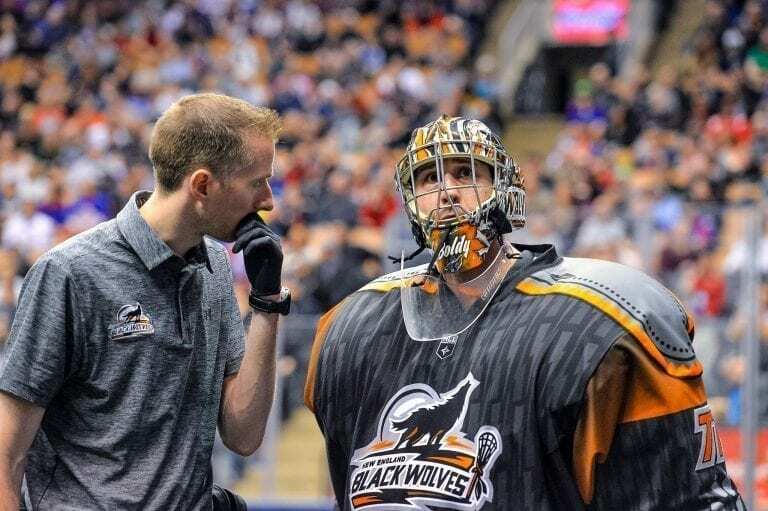 Where the Black Wolves struggle is that with a lack of draft picks, rebuilding is often a case of finding free agents or looking for players that were released elsewhere. The Black Wolves also lost Aaron Bold who was critical when they won games last year. While the Black Wolves traded for Alex Buque, I’m not so certain he’s even the better of the two goaltenders and I was surprised that Doug Jamieson wasn’t their #1 plan all along. New England is running into the problem of win now, or win never. They don’t have the draft picks to rebuild for several years. They have one of the oldest rosters in the league. If this prediction of 5th place is correct, don’t be surprised to see a fire sale part way through the year to try to get some of those draft picks back. Its never easy for any expansion team to not finish last in any sport. The Vegas Golden Knights may have given expansion teams everywhere hope, but they are very much the exception to the rule. And when you have a division where every team last year was so tight in the standings, for an expansion team to finish ahead of any of those teams will require a major effort. The Wings do have some big names upfront in Matisz, Currier, Hickey, Hall and the rookie Chris Cloutier. The big problem however is that as Kiel Matisz said on Lacrosse Classified this week, his teammates on the righty side have never played together, and learning how to play together takes time. Defensively, the Wings have recognizable names, but no names that stand out and make you take notice at this time. My biggest concern for the Wings is in goal where Davide Diruscio is the likely starter. He doesn’t have a lot of NLL experience, was injured most of last year, and once again isn’t the big name that makes you take notice. Unlike San Diego who has a proven starter in Scigliano, Diruscio doesn’t have that pedigree just yet. With a defense that will be looking to find its way, Philly is likely going to have to find a way to win games 17-15 on a regular basis, similar to the 2016 Swarm. The Rush beat the Bandits in the final. Pretty simple, the Rush are the class of the league and know what it takes to win. I’m not one to use the dynasty tag on the Rush just yet. But I may have to reconsider if they win another one. Last year I had just one prediction correct in the opening two weeks before making a big comeback. Let’s see if I can improve on that start this year. The Seals had hoped that they could draw another team to San Diego for an exhibition game, but when that didn’t work out, they decided to play an intersquad game and offered free tickets to the public, and 5,000 fans showed up to watch. That is a very good sign that the Seals will have success at the ticket office this season. They have far more season tickets sold than the Rush did in their opening season in Saskatoon. In part this is to one of the hardest working sales teams in the league. I’ve been contacted on six occasions by the team. While I’m hoping to make it for one game there this year, it was always good to talk to the staff to see how things were going and offer some advice. It was great to hear that they were not trying overly hard to attract the lacrosse player to their games as those fans will find them. Instead, a lot of the focus has been on finding people who are looking for an entertaining night out. I have little doubt that the Seals will get good crowds out this season. Now hopefully they can get some wins at home to keep bringing those fans in. One interesting point I saw on Twitter this past week was about Jordi Jones-Smith making the Rush roster. Jones-Smith had twice been cut as a junior in Whitby while Derek Keenan was the head coach there. The key, never give up and keep fighting. Hard work can eventually pay off. For all the latest, follow me on Twitter @SchemLax and make sure to follow the Lacrosse Classified podcast @LaxClass.